Two months ago, MAP reported on the dire circumstances faced by Syrians residing in refugee camps along the Syrian border (see story below). This winter has been the worst anyone can remember. For many of the Syrian refugees living in Lebanon and elsewhere far from their home, it has been deadly. Snow collapsed their tents. Winds blew away their makeshift shelters. And then came the cold rain and sleet that flooded and washed away the meager goods they had left. The weather has taken its toll on the young, old and everyone in between. Some have died from exposure and illness. Thousands continue to suffer the effects of untreated, serious illnesses. They are in desperate need of medicine and medical supplies and our partners on the ground have come to MAP. “We’re seeing respiratory infections and pneumonia,” said one doctor. “People are huddled together without adequate heat or nutrition for months. Those conditions take their toll. The babies are suffering some of the worst infections I’ve ever seen," said a pediatrician. Read our blog from January 10 below - it has been a difficult winter for people who have suffered from this eight-year civil war. We need your help immediately to continue support for women and families who have already suffered the unimaginable. Mafraq, Jordan-The clinic waiting room was already filling up when the young woman walked in, carrying a baby in one arm and holding the hand of a little girl. She looked exhausted and the baby was whimpering as the little girl coughed heavily. Clearly, the entire family was very ill.
BRUNSWICK, Ga., Jan. 12, 2017—MAP International is responding to the Syrian refugee crisis by delivering urgently needed medicines and emergency supplies to people who have fled to neighboring Jordan for safety. The U.N. Refugee Agency estimates 6.3 million people are internally displaced, and are desperately in need of medical assistance and care after escaping their war-torn home country. 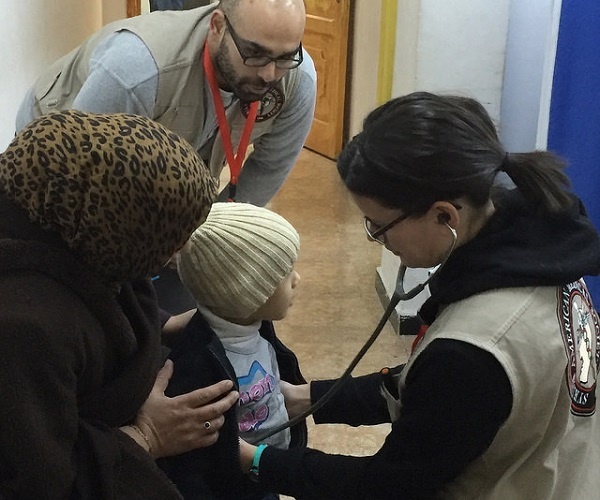 MAP International—along with more than 80 doctors, nurses and health representatives from its partner organization, the Syrian American Medical Society (SAMS)—delivered medical packs to refugees in Amman, Jordan, this week. The packs contain antibiotics, oral rehydration salts, pain relievers, cough and cold medicine, basic first-aid supplies, vitamins, personal hygiene supplies and surgical gloves.